Write your own autobiography with revolutionary WhiteSmoke writing software. 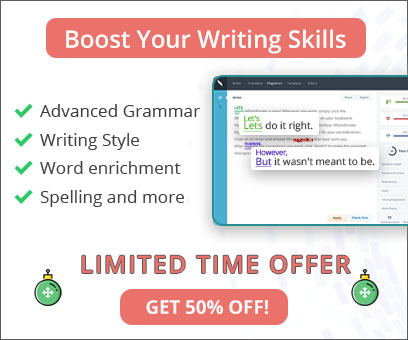 Every tool you need to improve your English writing now comes in one convenient package. With WhiteSmoke software, you have instant access to a spell check, always-improving punctuation check, and English grammar check. There is also an innovative enrichment capability that you won't find in other writing software! All of these features work together to give you the most comprehensive writing solution available. The WhiteSmoke solution is useful for writing in all styles, like legal writing, business writing, medical writing, and creative writing. The ready-to-use professional templates and writing tools all contribute to polished and professional finished products. One specific type of writing is the autobiography. 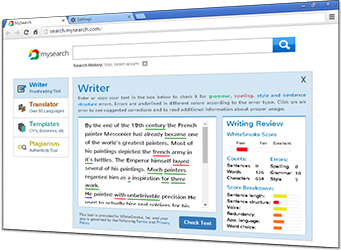 Besides the helpful tools already mentioned, WhiteSmoke also contains an online dictionary and thesaurus that you will find especially valuable when you are wondering how to write an autobiography. If you have been thinking about how to write a short autobiography (or a long one), try answering the following list of questions as a way to get started in writing your autobiography. Why are you writing an autobiography? For yourself, friends, family members? You might choose to tailor the style of your writing and the information you include according to your audience and purpose. Who are you in life? This question is very broad, so it can include information from what your name is to where and when you were born to all of the experiences you've had in your life until now. You might wish to include things you are particularly proud of like awards you've won in this section, but you are really unlimited in what you choose to focus on. What does life mean to you? In this part of your autobiography, you should consider where you are in your life now, in the present. What are your feelings about your life and the things in it? Are you pleased or dissatisfied? What is your outlook on the future? After you have considered and written about what happened in the past and what is happening in the present, a logical and fine way to end an autobiography is to consider the future. You can relate what you have already written about to what might happen, or write something entirely separate. Because an autobiography is your story, you decide what you will include and what you will leave out. No matter if your task concerns how to write an autobiography for a man or for a woman, the final step you must take is proofreading. To proofread thoroughly, you need to check your English grammar for things like subject verb agreement, determiners, and appropriate prepositions. This can be tricky, but WhiteSmoke online writing software is designed to catch mistakes in these with its English grammar check. WhiteSmoke also contains a thorough spelling checker and punctuation check for those other important elements of proofreading.